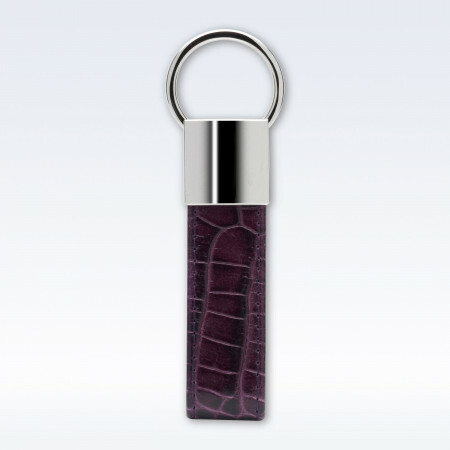 This elegant, contemporary Loop Leather Key Fob has a convenient, easy key change 'O' ring mechanism. A thoughtful small gift for a man or woman who appreciates fine craftsmanship and proficient design. Made using the most luxurious soft Italian leather. Key fob made from luxury soft Italian leather. Shiny chrome metal 'O' ring together with leather key fob. Of course our products are designed to show the wear and tear of everyday life and mature with age. Should you wish to retain the new look for as long as possible please do consider the guides below. St James Leather or StJ products should reach you in perfect condition. If this is not the case please contact us immediately. All products manufactured by us come with a lifetime manufacturer's guarantee for the natural life of the product. Due to the craftsmanship quality these products are designed to last. However should there be any failure of stitching, or of the hardware - the lock, strap attachments, mechanisms and so on - we will of course rectify the matter free of charge within the first year of purchase (Proof of purchase date is required). Please note, we cannot be responsible for tears, abrasions or damage from misuse; however we can still repair for a reasonable fee. Please email us at info@stjleathergifts.com in the first instance stating the nature of the problem and date of purchase. We will then contact you immediately to help you rectify the problem. Please return all items to us using a signed for postal service. There are four main stages in leather care that include cleaning, conditioning, polishing, and protection. To clean a leather item you must first select a cleaner that will help preserve the natural lubricating oils instead of stripping them. For example, saddle soap is a commonly used product for equestrian tack. It is supposed to be used as a cleaner and a protector from moisture, however it strips the leather of the natural oils in the process of attempting to do both jobs at once. The cleaner of your choice should not leave any greasy residue behind as this makes leather susceptible to bacteria and can break down the stitching of your item. Test it out for effect and possible colour distortion on an area that isn't visible to the eye. For areas with stitches, there are brushes available on the market. Another cleaning product to consider having in your leather care collection is a nubuck cleaning cloth. They have an astonishing ability to clean and restore leather to its original look. Use leather conditioners occasionally. Conditioners contain fats and/or oils which lubricate and replenish the suppleness. Ideally a product that will penetrate the strong fibres in leather. Beware of any conditioners that include petroleum or mineral oils. While petroleum by-products won't damage your leather immediately, they will over a period of time. Thick, greasy conditioning treatments are the best care of your leather. Beware of products that contain colourings as they may brush off on things you come in contact with. Some products also have a tendency to clog the pores in leather or dry leather out. Just as with cleaning, be sure to test out the product on a small. If your product does get wet the key is to treat wet leather before it has a chance to dry. Carefully remove any dirt, mud, or other stains with a good cleaning agent, and condition while the pores are still responsive. The leather should then be dried away from heat. Being a natural material leather should never be stored in plastic because it encourages the growth of mildew and bacteria and will ruin the leather. Instead store leather in a cool, dry place away from heat. Fresh stains can be cleaned quickly with a damp cloth. Stains from oil or grease can be lifted by grinding ordinary blackboard chalk, sprinkling the area, and leaving the powder on for a twenty-four hours. DO NOT the urge to rub the powder in. Remove the dust with a leather care. While fresh stains can be treated and cleaned at home, ground-in stains should be attended to by a professional.